eStone is an end-to-end procurement based process medium which was exclusively created by eNoah’s Tech Lab to fit the needs of Granite and Marble industries.It can be expertly customized to accommodate your unique requirements. The Selection and implementation of ERP have two key drivers- managing business processes and providing enhanced reporting. 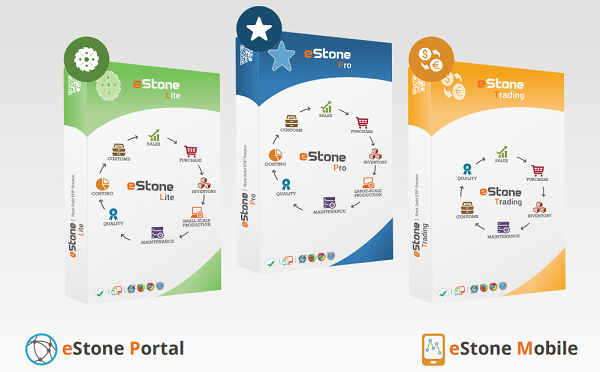 eStone provides the functionality that is needed for all Small and Medium Business organizations. eStone is designed to replace the existing practice of using excel sheets to store and analyze data and can seamlessly be migrated to from any legacy system that is currently being used by your company. eStone provides easy data retrieval and data storage mechanisms that are built to sustain growing business demands. Enterprise Resource Planning (ERP) integrates internal and external management information across an entire organization, embracing Finance and Accounting, Manufacturing, Sales, and Service, etc. ERP systems automate this activity with an integrated software application.The purpose is to facilitate the flow of information between all business functions inside the boundaries of the organization and manage the connections to outside stakeholders. ERP systems can run on a variety of hardware and network configurations, typically employing a database to store and process information. With eStone’s fully loaded wide-ranging capabilities, a well-integrated IT roadmap is designed that can support all your business demands – real-time information, streamlining, integrating and connecting every area from merchandising to customers and stores.